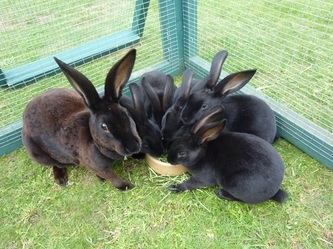 Consists of Mum who is being neutered on 15th Sept and her 5 offspring – 4 boys and a girl (Peach). They are the result of an unplanned litter when her previous owner allowed contact with a nice young man! 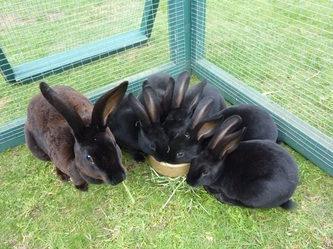 The babies were born in the middle of July so are not currently old enough to be neutered – but the boys will be soon. We are not looking to rehome the family together but they will go as companion rabbits.They are a little bit skittish but are gradually getting used to being picked up. Whilst being held they do not scratch or bite – but they can wriggle a bit. 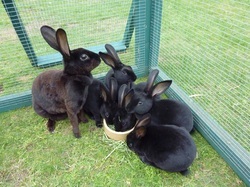 Mum does not like having her ears touched but is good natured and does not appear to show any territorial signs.If you are unfamiliar with the Rex breed their fur is like velvet and they are long, thin rabbits.